The Three Kingdoms Period of Korea (hangul: 삼국시대) featured the three rival kingdoms of Goguryeo, Baekje and Silla, which dominated the Korean Peninsula and parts of Manchuria for much of the 1st millennium C.E.. The Three Kingdoms period in Korea extends from the first century B.C.E. (specifically 57 B.C.E.) until Silla's triumph over Goguryeo in 668, marking the beginning of the North and South States period (남북국시대) of Unified Silla in the South and Balhae in the North. The earlier part of that period, before the three states developed into full-fledged kingdoms, sometimes has the name Proto-Three Kingdoms of Korea. The Three Kingdoms of Korea marked the foundation of the unified Korean Peninsula that emerged later during the Goryeo and Joseon dynasties. Samguk Sagi (twelfth century) and Samguk Yusa (thirteenth century) mention the "Three Kingdoms." Founded soon after the fall of Gojoseon, the three city-states gradually conquered and absorbed numerous other small states and confederacies. After the fall of Gojoseon, the Han dynasty established four commanderies in northern parts of the Korean Peninsula. Three fell quickly to the Samhan, Goguryeo destroyed the last in 313. Baekje and Silla expanded within the Samhan confederacies, and Goguryeo conquered neighboring Buyeo, Okjeo, Dongye, and other statelets in northern Korea and Manchuria. The three became full-fledged kingdoms by around 300 C.E., following the Proto-Three Kingdoms period. All three kingdoms shared a similar culture and language. Their original religions appear to have been shamanistic, but Chinese culture increasingly influenced them, particularly Confucianism and Daoism. In the fourth century, Chinese missionaries introduced Buddhism to the peninsula which spread rapidly, becoming the official religion of all three kingdoms. Goguryeo emerged on the north and south banks of the Yalu (Amrok) River, in the wake of Gojoseon's fall. The first mention of Goguryeo in Chinese records dates from 75 B.C.E. in reference to a commandery established by the Chinese Han dynasty, although even earlier mentions of "Guri" may be of the same state. Evidence indicates Goguryeo, the most advanced, likely established first among the three kingdoms. Goguryeo, eventually the largest of the three kingdoms, had several capitals in alternation: two capitals in the upper Yalu area, and later Nak-rang (樂浪: Lelang in Chinese), now part of Pyongyang. At the beginning, the state located on the border with China, gradually expanding into Manchuria and destroying the Chinese Lelang commandery in 313 C.E. The cultural influence of the Chinese continued as Goguryeo adopted Buddhism as the official religion in 372 C.E. The kingdom reached its zenith in the fifth century when occupying the Liaodong Plains in Manchuria and today's Seoul area. The Goguryeo kings controlled not only Koreans but also Chinese and other Tungusic tribes in Manchuria and North Korea. After the establishment of the Sui Dynasty in China, the kingdom continued to suffer from Chinese attacks until conquered by the allied Silla-Tang forces in 668 C.E. Goguryeo emerged as the protector of the Korean Peninsula. Without Goguryeo blocking out Chinese invaders, Silla and Baekje would surely have fallen. Baekje numbered among the kingdoms of the Mahan confederacy. Two sons of Goguryeo's founder, recorded as having fled a succession conflict, established Baekje in the proximity of the western Korean peninsula. Baekje absorbed or conquered other Mahan chiefdoms and, at its peak in the fourth century, controlled most of the western Korean peninsula. Under attack from Goguryeo, the capital moved south to Ungjin (present-day Gongju) and later further south to Sabi (present-day Buyeo). Baekje colonized Jeju island and may have colonized the southern part of Japan called Khusu. Baekje's cultures influenced Goguryeo, Silla and also Japan, possibly stimulating the creation of Japan's Asuka culture . Baekje played a fundamental role in transmitting cultural developments, including Chinese characters and Buddhism, into ancient Japan. Baekje merged into Unified Silla after falling to an allied Silla and Tang force in 660 C.E.. According to Korean records, in 57 B.C.E., Seorabeol (or Saro, later Silla) in the southeast of the peninsula unified and expanded the confederation of city-states known as Jinhan. Although Samguk-sagi records Silla as the earliest-founded of the three kingdoms, other written and archaeological records indicate that Silla emerged as the last of the three to establish a centralized government. 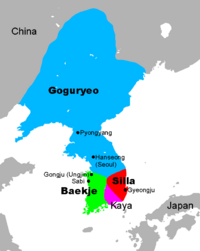 Renamed from Saro to Silla in 503 C.E., the kingdom annexed the Gaya confederacy (which in turn had absorbed Byeonhan earlier) in the first half of the sixth Century. Goguryeo and Baekje responded by forming an alliance. To cope with invasions from Goguryeo and Baekje, Silla deepened its relations with the Tang Dynasty, with her newly-gained access to the Yellow Sea making direct contact with the Tang possible. After the conquest of Goguryeo and Baekje with her Tang allies, the Silla kingdom drove the Tang forces out of the peninsula and occupied the lands south of Pyongyang. Silla established its capital in Seorabeol (now Gyeongju). Buddhism became the official religion in 528. 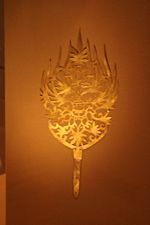 Archaeological findings, including unique gold metalwork, reveal a culture in the kingdom of Silla that displays influence from the northern nomadic steppes, differentiating it from the culture of Goguryeo and Baekje where Chinese influence prevailed. Allied with China under the Tang dynasty, Silla conquered Goguryeo in 668, after having already conquered Gaya in 562 and Baekje in 660, thus ushering in the period of Unified Silla to the south and Balhae to the north. Korean historians use the concept of (guk or Sino ko: 國, walled-town state, etc) to describe early Korean history. Among the archaeology sites dating to the Three Kingdoms of Korea, hundreds of cemeteries with thousands of burials have been excavated. The vast majority of archaeological evidence of the Three Kingdoms Period of Korea consists of burials, but since the 1990s excavations of craft sites, roads, palace grounds and elite precincts, ceremonial sites, commoner households, and fortresses have been uncovered during the building boom in South Korea. Chiefdoms in Korea date to c. 700 B.C.E. (e.g. see Igeum-dong, Songguk-ri) (Bale and Ko 2006; Rhee and Choi 1992). Recent archaeological evidence suggests that states formed on the Korean peninsula between 300 B.C.E. and C.E. 300 to 400 (Barnes 2001; Barnes 2004;Kang 1995;Kang 2000; Lee 1998; Pai 1989). Since 1976, continuing archaeological excavations concentrated in the southeastern part of modern Gyeongju have revealed parts of the so-called Silla Wanggyeong (Silla capital). A number of excavations over the years have revealed temples such as Hwangnyongsa, Bunhwangsa, Heungryunsa, and 30 other sites. Elements of Baekje capitals have also been excavated such as the Mongcheon Fortress and Pungnap Fortress. Bale, Martin T. and Ko, Min-jung. 2006. "Craft Production and Social Change in Mumun Pottery Period Korea" Asian Perspectives 45(2):159-187. Bale, Martin T. 1998. "Further investigations of Ko-Silla tomb social ranking using archaeological quantitative analysis techniques" Jinruishi Kenkyu [Journal of the Society of Human History] 10:54-63. Barnes, Gina L. 2004. "The emergence and expansion of Silla from an archaeological perspective" Korean Studies 28:15-48. Best, J.W. 2003. "Buddhism and polity in early sixth-century Paekche" Korean Studies 26(2), 165-215. Kang, Bong-won.(2000. "A test of increasing warfare in the Samguk Sagi against the archaeological remains in Yongnam, South Korea" Journal of East Asian Archaeology 2(2-4):139-197. Na H.L. 2003. "Ideology and religion in ancient Korea" Korea Journal 43(4), 10-29. Pai, Hyung Il. 1989. "Lelang and the interaction sphere: An alternative approach to Korean state formation" Archaeological Review from Cambridge 8(1):64-75. Pearson R, J.W. Lee, W.Y. Koh, and A. Underhill. 1989. Journal of Anthropological Archaeology 8(1):1-50. Rhee, S.N. and M.L. Choi. 1992. "Emergence of complex society in Korea" Journal of World Prehistory 6(1):51-95. Asian.info: Three Kingdsom of Korea. Lee, Soyoung. "Korean Buddhist Sculpture (5th–9th century)." In Timeline of Art History. New York: The Metropolitan Museum of Art, 2000–. (October 2002). Minneapolis Institute of Arts: Three Kingdoms. History of "Three Kingdoms of Korea"